It’s important to keep on top of what homebuilders are featuring in their new homes. 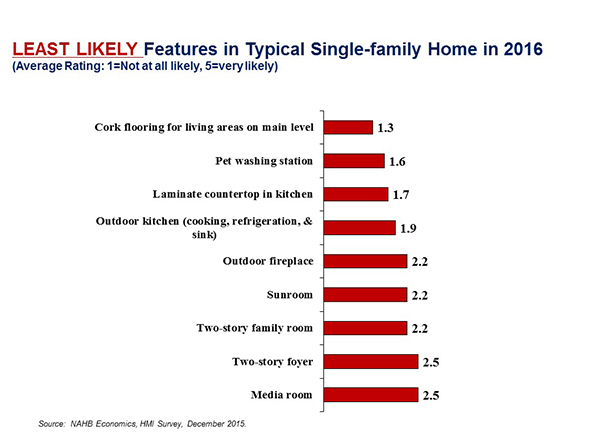 In December 2015, a nationwide survey asked builders about the likelihood of certain features being included in their typical single-family homes. Using a scale of 1 to 5 (1 being not likely at all and 5 being very likely) the builders reported the following as the most likely features to show up in a typical 2016 home. Several features that help owners with energy conservation are also highly likely to be included in new homes this year. Examples include low-e windows, ENERGY STAR® appliances and windows, and a programmable thermostat. Other likely candidates: 9’ ceilings on the first floors, a central island and granite countertops in the kitchen. 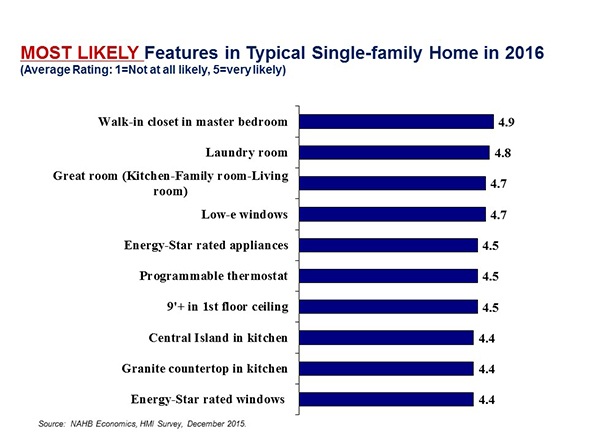 On the flip side, the survey also ranked the least likely features to be included in a 2016 home. Two story spaces (family room and foyer) also seem to be unlikely features as well as outdoor fireplaces, sunrooms and media rooms. Originally published on NAHB’s blog, Eye on Housing.